Distribution: From Northern Australia to central WA UP TO Northern NSW to a depth of 20 metres. 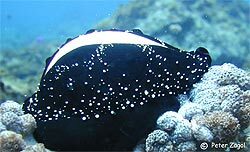 Ecology: The Egg Cowrie is a harmless carnivore and feed s exclusively on soft corals and sponges. There are separate males and females, which are often found together. Female egg cowries are sometimes seen guarding their brood. The eggs can mostly be found on species of soft coral that is toxic to fish but the egg cowrie is able to neutralise toxin and feed on the coral. Interesting facts: When under attack, the mollusc's mantle seems to serve as camouflage, confounding predators. This feature seems to be an evolutionary adaptation generally characteristic of the many of the cowrie families. It is also shared with the more advanced sea slug (nudibranch) families. Status: The current vulnerability status of the egg cowrie is low however it is sometimes eaten but mostly collected for its shell. Like all gastropod molluscs the calcium carbonate shell will be effected if the ocean acidification increases even slightly .